Jobable.com is Asia’s first data-driven career platform. Jobable uses a matching score to eliminate the noise in the hiring process and efficiently connect job seekers to the best opportunities and companies to the best talent. Since launching in 2016, Jobable.com has helped companies across Hong Kong to fulfil their recruitment needs more effectively than ever before. 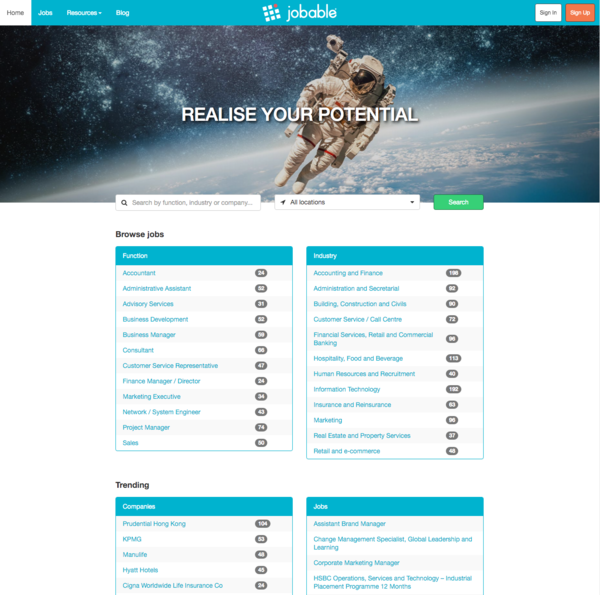 Jobable raised a pre-series A investment of US$800k in September 2015 from Hong Kong and European based Angel Investors and the team is working hard to expand their product offering to Job Seekers and Employers throughout Hong Kong and then the rest of Asia. "Life is just a game of inches"
"If you're the smartest person in the room then you're in the wrong room"